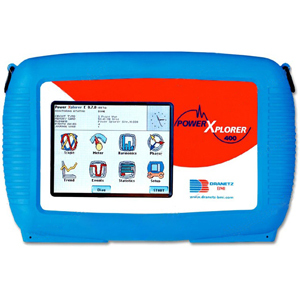 The PowerXplorer integrates the most advanced feature set available in a power monitoring instrument, with an easy-to-navigate, color graphical user interface. With high-speed sampling and data capture (1 microsecond/channel), this 8-channel workhorse simultaneously captures and characterizes thousands of parameters, using a range of standard and customizable operating modes. The unique measurement capabilities of the PowerXplorer include capture of low-medium-high frequency transients through peak, waveshape, rms duration and adaptive high-speed sampling, as well as power measurements to clearly characterize non-sinusoidal and unbalanced systems.